The Norton Field Guide lets you teach the way you want to teach. Short chapters with just enough detail can be assigned in any order. Color-coded links send students to more detail if they need it. Menus, directories, and a glossary/index all make the book easy to navigate. This flexibility makes it work for first-year writing, stretch, ALP, co-req, dual-enrollment, and integrated reading-writing courses. A NEW section helps students transfer what they’re learning in first-year composition to their other courses. Short examples are drawn from a variety of disciplines and genres, and tips, techniques, key terms, and concrete advice are included. This coverage enhances the genre-focused advice for which the book is known, making it a good choice for helping students transfer what they’re learning to their other courses. NEW guidance on evaluating and comparing sources, along with advice on identifying misinformation (fake news) and bias, is essential for students today. This guidance helps students gauge the reliability of works they might cite in their own writing. This is further reinforced by NEW InQuizitive adaptive-learning activities that sharpen students’ research skills. New guidelines for identifying the rhetorical situation help students assess the reliability of a source and discern potential bias—including their own. Coverage of confirmation bias is included as well. NEW InQuizitive activities on research give students practice working with sources so they’re prepared and confident to conduct their own research. The Fifth Edition features 78 readings—31 in the rhetoric chapters in the front of the book and 47 in the anthology in the back. Thirty-five new selections provide fresh sources for student writing and class discussion. Instructors can focus on genres, rhetorical strategies, the writing process, research, writing across the disciplines, and more. Short chapters can be assigned in any order—and color-coded links help users locate additional information related to a topic. As a result, the text avoids the redundancy that burdens competing books. Intuitive digital resources afford additional flexibility by making it easier to engage students outside of class or in online learning environments. The resources that support the text will save you time and help your students become better writers. InQuizitive activities build student confidence by developing essential skills, such as editing sentences and working with sources. 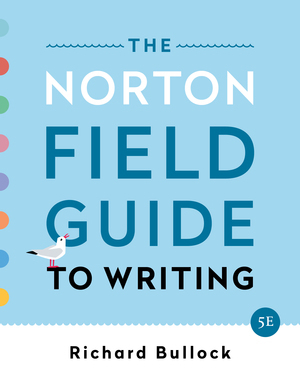 InQuizitive can now be packaged at no additional charge with any version of The Norton Field Guide. Student assessment and review materials can be uploaded directly into your campus learning management system. And instructors will find the support they want and need in the comprehensive Instructor’s Manual. *♦Kelly Green, "Researching Hunger and Poverty"
*♦Catherine Thomas, "Social Media and Data Privacy"